Thin-Lite brand 12 LED 12 volt surface mount light fixture. 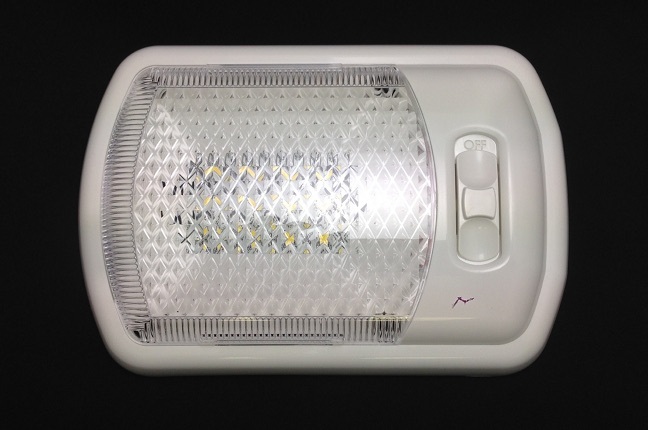 Great replacement for original incandescent fixtures used on campers and RV's. Mounts anywhere on a flat surface. Great ceiling fixture or dome light. Fixture measures 7.652"" x 5" x 1". Gloss white finish with clear prismatic lens. Attaches with 4 screws (not included). Hole spacing for mounting screws is 3.5". Usually ships by next business day. Allow an additional 1-5 business days for delivery to most US locations. Express shipping available. I purchased this LED light fixture to replace the original fixture in my '99 EuroVan Camper. It was not expensive and seemed to work similar to the original. However, I did not like the quality and before I made new screw holes in my poptop, I gutted all the parts in the new light and transferred them to the original and was happy with the result. A new quality LED bulb can cost as much as this fixture, so no biggie. I may consider installing a dimmable fixture at some point as this LED is very bright which is sometimes good and other times too bright.